I hope you are well and keeping warm! I have not been around much in blogland because (drum role) I have had my first commission ~ yay! Remember this card, well the recipient contacted me and asked if I could make it into Christmas cards for him and I said yes ~ well what else was I going to say! They finally went in the post today all the way to Spain ~ yes I've gone international! Will post some photos later. 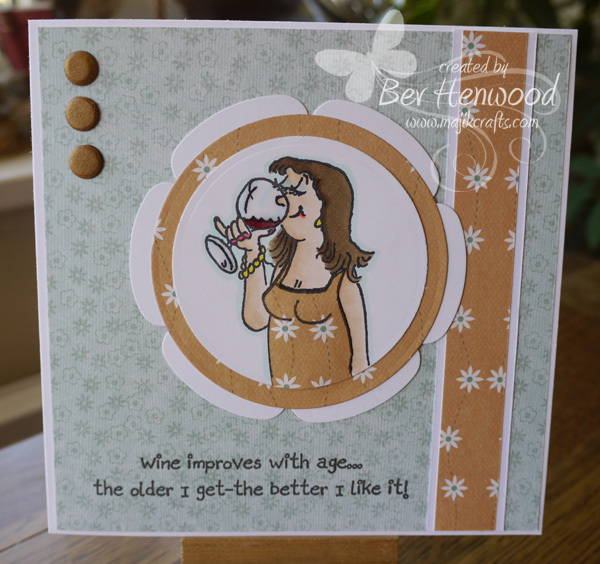 Today I have a quick share ~ this is a card I made for a friend, who like me enjoys the odd glass of red. I saw these stamps in a magazine feature earlier in the year and bought the whole set, ideal when you want a slightly quirky and humerous card ~ not everyone likes cute. When I had finished colouring the image, I decided I didn't like the colour of her dress (blue), so I had a lightbulb moment ~ don't get many of those ~ and decided to paper piece it. I think it works okay? It doesn't show up on the photo, but I used Glossy Accents on the wine glass to make it sparkle. Well, must dash ~ housework to catch up on after all that card making ~ lol! Have a lovely evening and weekend. JUst GOrgeous FABulous colours and I LOve your paper piecing..
Count me in for a glass or two lol. Brilliant card Bev and I love the paper pieced dress. I saw these stamp sets at the NEC in March .. .. guaranteed to raise a smile! My kind of card Bev. Just enjoying a glass of wine as I am blogging. Fab paper piecing and image.